Blustery with clouds and limited sun. Highs in the 30s, wind chill in the 20s. 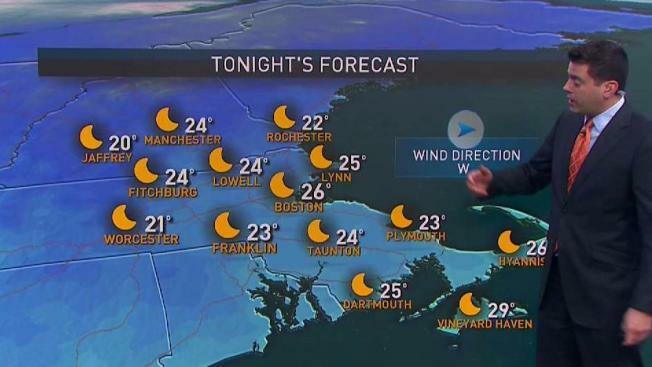 Overnight Friday: Clear, breezy. Lows in the 20s, wind chill in the teens. Saturday: Building clouds, chance flurry, chilly wind. Highs in the 30s, wind chill 20s. The storm that hit on Tuesday is still having an impact on New England. Many clouds and mountain snows continue this morning, with temperatures starting in the 20s. Any melting on the sidewalk yesterday means we icy spots through 8 a.m.
Colder air is moving in today with equal amounts of cloud and sunshine, snow continues in the mountains. High temperature in the 30s south, 20s in the Hills, wind gusting past 25 miles an hour from the northwest add an extra chill. It will be fair and cold tonight, low temperature in the single numbers and teens north, and 20s south. Another cold front whips from north to south with sunshine and a snow squall tomorrow, high temperature in the 20s north to 30s south. Wind from the northwest could just pass 40 mph in any squall. High pressure brings clear and close to record cold air for Saturday night and Sunday morning, low temperature below zero at the Canadian border to the teens along the south coast. All the St. Patrick's Day parades on Sunday should be dry, but cold and bright with high temperatures near freezing at best. A weak front may bring a snow shower to northern sections Monday, otherwise bright and on the cold side. The plot really thickens on Tuesday, a system that's coming in off the Pacific now will go off the east coast Tuesday. Every storm that has done that in the last few weeks has had an impact on New England, this time it looks like a mixture of rain and snow at the coast and snow inland is possible by Wednesday. It's early to give any kind of impact statements right now. The system may try and miss out to sea or could come closer like the last three did.